A decade after touching down on the martian surface, NASA's Opportunity rover—which is still ticking, by the way—has achieved a rather unique record: the farthest distance covered by a vehicle off-world. Opportunity breezed past the 25-mile mark just this past Sunday, overtaking the previous record held by the Lunokhod 2, which held the previous record since 1973. A marathon is 26.22 miles, so Opportunity is just about a mile away from surpassing that incredible milestone. NASA made a handy little graphic detailing some past accomplishments by other rovers. 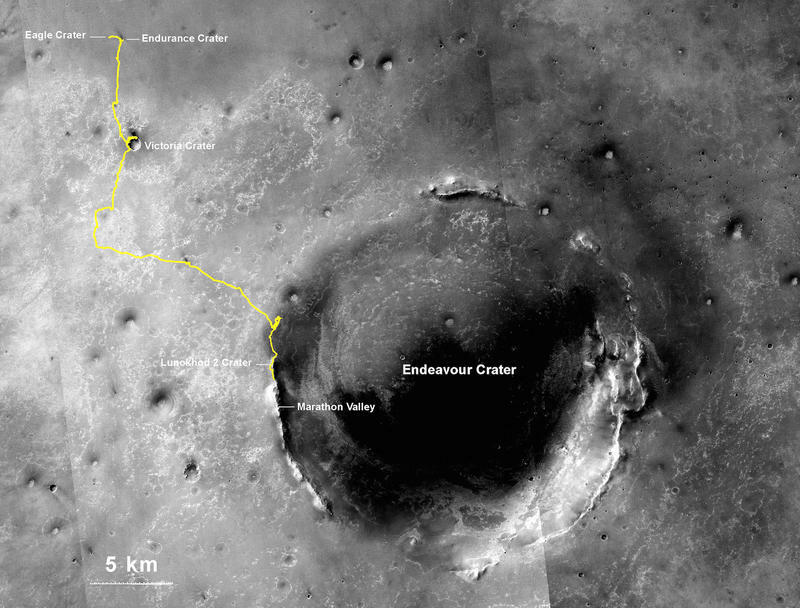 Curiosity, which landed back in 2012, has traveled just over 5 miles. The Apollo 17 Lunar Rover, which touched down on the moon all the way back in 1972, holds the third spot just over 22 miles. Most of the rovers were launched by NASA, while others, including a few from the Soviet Union and one from China, are also thrown into the mix. "Opportunity has driven farther than any other wheeled vehicle on another world," said John Callas, Mars Exploration Project Manager. "This is remarkable considering Opportunity was intended to drive about one kilometer and was never designed for distance." Maybe the Martian landscape is much more accommodating than we originally thought. But it's really not about distance that has NASA excited; it's how much data the rover was able to collect in that ten-year period. With Opportunity still on the move, the rover has been able to examine evidence of environments with less acidic water. When the rover touched down at its initial landing site, there was no such evidence. With Opportunity able to endure such a long lifespan, NASA has plans to send it to investigate "Marathon Valley," where orbiting observations have indicated a site where several clay minerals are exposed. If Opportunity can continue to hold out, who knows, maybe one day humans will be able to join the rover for a leisurely stroll on the Martian surface.